Facebook is the world’s largest social network, with more than 1 billion users. 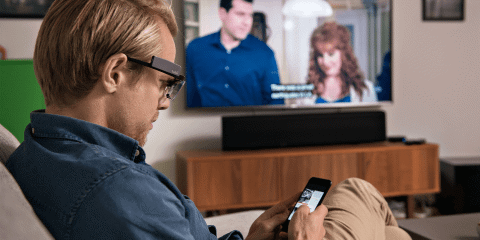 The company wanted to a get an accurate understanding of how people watch TV in their homes today, and how pervasive multiscreening is while watching. Facebook IQ, the social network’s research division, commissioned Tobii Pro Insight to conduct an eye tracking study in the home environment. People in four US cities were asked to take home a pair of Tobii Pro Glasses 2 on a weeknight and wear them as they went about their normal evening routines. The data from 100 participants who chose to watch TV was then analyzed. The study revealed that 94% of the participants kept a smartphone nearby while watching TV, proving that mobile and TV are a very strong combination. On average, when participants were watching TV their eyes were diverted from the screen 47% of the time. Different distractions in the home drew their attention away most often, followed by smartphones and screens on other digital devices. Another major finding was that when participants were not looking at their TV, they still heard it – which led Facebook to recommend that advertisers create TV ads with engaging and memorable audio.